Congratulations everyone, the awards dinner on January 23rd was a fantastic success just like our 2015 season. Thanks to Jeremy Cratty for getting the International to take care of us again this year. What a great venue. Thanks to Russ Campbell for putting together the slide show, award trophies and presentation. Thanks to Mark Bernard for pulling together all the stats. 2015 was an amazingly successful season. Minuteman Road Club raced in 239 races resulting in 53 podiums and 151 top 10 finishes! U23 racer of the year – Patrick Collins had a great road season but it was just a precursor to an unbelievable cross season that culminated in 1st place in the season long NECXBAR series. 1st place in New England!!! Top female racer of the Year – Megan Woodacre with 3 podiums in her 1st year of racing an outstanding way to start her road racing career. Top male racer of the year – Brad Bradford progressed from Cat 5 to Cat 2 in 1 year and clocked up 7 wins, 3 2nd places and 1 3rd along the way. A quite remarkable season. What else is there to say? Well Brad certainly did with lots of praise for the club and and an impassioned farewell as he has moved back to Toronto. Most improved – Winslow Woodacre with 2 wins and 3 other podiums in his 1st year road racing showed that there is a lot more to come. 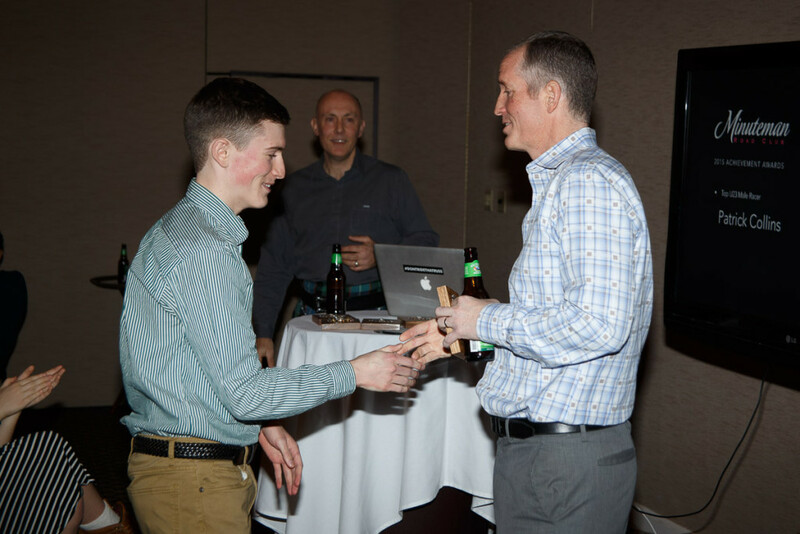 Patrick Collins receives his Top U23 Award from Jeremy Cratty.